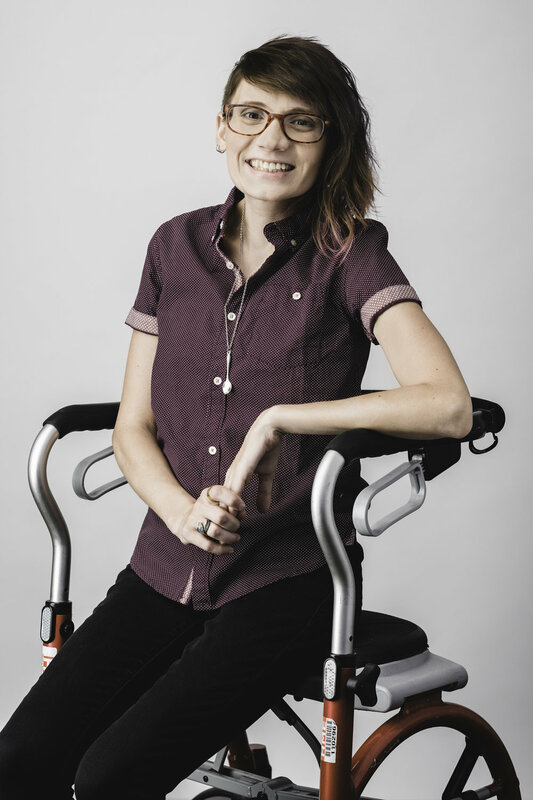 Kate Welsh is a white settler, cis queer crip community activist, feminist artist and educator. She is passionate about building communities of care and striving to create safer, anti-oppressive spaces. Living with both visible and invisible episodic disabilities, Kate navigates complex experiences through art, activism and community care. Kate’s interests include community building, feminism, intersectionality, disabilities, queer identities and knowledge sharing. Kate was born and raised in the US but moved and then immigrated to Canada and has been in Toronto for over ten years. Kate did her undergraduate education in sociology and drama studies and is involved in the Toronto indie theatre community. Particularly participating in collaborative theatre creation as a part of Buddies in Bad Times queer youth arts program as well as the Artists Mentoring Youth Project (AMY). Over the past 7 years she has had to refocus her art practices away from theatre as her ability fluctuates. Kate finished her Masters of Education at OISE in spring 2017 where she focused on researching queercrip identities and resiliency strategies. Additionally she facilitated weekly crafting workshops for Hart House’s wellness programs, she runs LGBTQ community wellness and mental health groups and continues to co-author books for WomanSafeHealth on women’s health care and advocacy. Most recently Kate has been working on an initiative to promote the social inclusion, awareness and policy recommendations for people with Episodic Disabilities, disabilities that have periods of wellness and periods of illness including many chronic health conditions. She has been exploring ways in which to not just change policy but make lives better now by creating consumable art that tackles hard to talk about topics such as chronic illness. CRIP (Community.Resistance.Intimacy.Project.) is a collective based out of Toronto using arts and education to facilitate connections within the disabled community. Kate has been on CBC radio speaking about this project. Kate did an artist residency on the Toronto island in May 2017 with a bunch of other feminist artists. In this process she created 11 "greeting/get well" cards for folks with disabilities and chronic illnesses. To see the exhibition @ Hart House go here. Info here: Become a Patron!